In the home theater industry, as with any other industry, the terms used for various professional services mean different things to different people. Professionals and customers alike mix and match and misuse words until their true meanings are lost. An example of this happened recently when a customer asked, "Is there a difference between home theater design and home theater installation?" The answer is "Yes, there is a difference." The difference between these two terms is pretty simple. Home theater design is the precursor to home theater installation. Without the design phase, your home theater installation becomes a cookie cutter project filled with regret. Home theater design puts the "Custom" in Custom Home Theater. 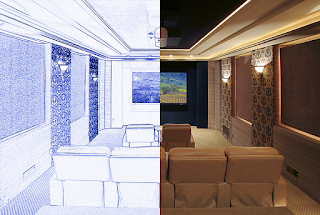 A home theater designer listens to the customer's input, studies the pre-existing structure of the room for audio, video, and lighting conditions, remembers the budget, and then creates a plan based on those assessments. Good design puts you on the path to having the best quality possible. A home theatre installation is not as effective without the design element. While there may be some companies who only provide one service or the other, most will have both in house. Terracom Systems offers creative design with leading technical knowledge to give you a unique and first-rate home theatre. In our last blog post we asked the question, "Should I Install a Home Theater System?". We took a look at the benefits of installing a custom-built home theater system. In the end, the decision really came down to the importance of the quality of your home entertainment experience. If quality home entertainment experience is the primary reason for investing in a custom home theater system, then you have to hire a company that's proficient at both design and installation. If the design falls short, so will the quality.